Wholly unique and transformative : Limitless Sky is beyond a book. It is a rich and life-changing collection of knowledge and anecdote that can, if one truly embraces it, utterly transform a limited perspective of life. David has done a great service to humanity in meticulously transcribing the Jhankri’s philosophy and so vividly recounting the wisdom imparted by the various other individuals he encountered on this Indian Iliad. It is part novel, part encyclopedia and part spiritual text. It is erudite, humorous, sensual and provocative. It is full of insights that generously contribute to an essential discourse about how we might make sense of this ‘living’ that we are all united by and to articulate how we might obliterate the perceived differences that keep us detached from our true natures. It seems clear that David embarked on this odyssey of awakening initially for personal reasons but he has ensured that the fruits of his journey are now out in the open for us all to ingest and be nourished by. Perhaps it was with an unwitting sense of what he was to become that he first met this shaman, but in skilfully recounting his travels, he has delivered a powerful gift for us all to vicariously be changed by. A change that begins with words on a page and with digestion and an open heart has the power to ‘enrich the ordinary’ and utterly shift the standpoint of our daily lives. I closed the book with increased fervor to ruthlessly examine the choices I am making about how to use what time remains of my own life, and that of course will have an effect on all those I come into contact with. 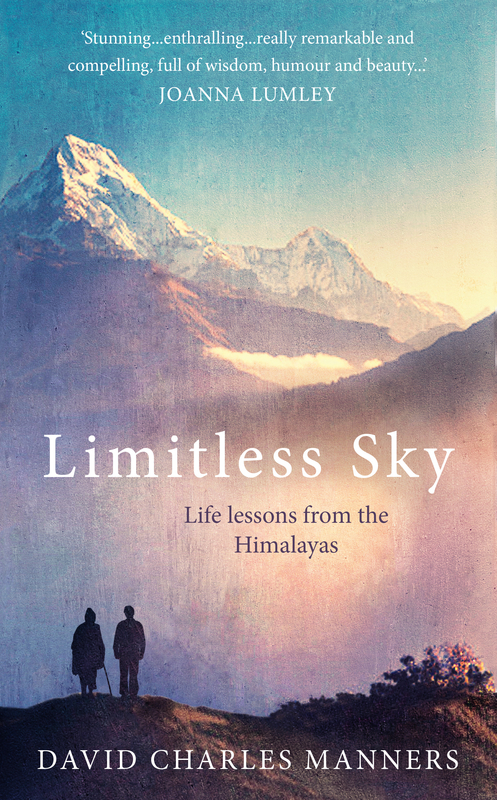 ‘Limitless Sky’ is quite unlike anything I’ve read before; that I feel richer for having done so, edified and invigorated, is a testament to the scope of Manners’ achievement. The tradition of which ‘Sky’ treats and to which the author is initiated is utterly fascinating; an inveterately humanist ethic, cogent, practicable and wholly pertinent. It is in many ways the most nourishing invitation to understanding I’ve encountered. A joy compounded by the obvious skill employed in its elucidation. Manners’ style is fluent, lucid and irrepressibly appealing. An admirable blend of wit and lambency together with the linguistic precision of good philosophy, admirable not only on account of the beauty inherent to its euphonic prose, but as something of a balancing act – an equilibrant effort, the execution of which is estimable though never intrusive. To be at once wry and conversational while maintaining the rigour and concision necessary for instruction is no mean feat, especially without succumbing to wild inconsistencies in style. In the face of such potential hazards Manners’ strong and congruous prose is laudable. But the book is not merely didactic and how lucky we are that it’s not. For though a popular study of the tradition would be invaluable it could not, as a work to be savoured, hope to equal what Manners has accomplished here. For while the curative involutions of Tantra are, for a layman like myself, so deftly disentangled as to instil its lessons with an enticing practicality, no small amount of the book’s charm arises from the person of the author not only in his function as narrator but participant, the proxy whose curiosity satisfies the reader’s own, whose experience gives ‘Sky’ not only its narrative base but an emotional reality beyond the purview of simple reportage. This is to say that Manners’ obvious and deserved affection for his teachers and friends serves then to elevate ‘Sky’ to something more than cool inquiry. While his willingness to give of himself, without recourse to endless introspection, grounds what in less discerning hands might have been a paralysing superfluity of information in an enthralling and consistently evocative biography; the events of which I refrain from enumerating. It would be vulgar to attempt so necessarily brief a summation of another’s experiences, especially when they exceed in wonder anything within my own canon occurrence. Suffice to say the narrative heart of ‘Sky’ equals the magnetism with which it is articulated – Manner’s candour and generosity of thought shine of the page. A life changing book – This book charters David’s amazing journey in the Himalayas about how he found “The Tradition” or perhaps how “The Tradition” found him. “The Tradition” is a life-affirming path, many centuries old passed down from generation to generation and is a practical blueprint for life that encourages you to live a life without judgement or self-interest, to acquire self-knowledge but above all to fully engage with life and to live it fearlessly and joyously looking after yourself and others. I try every day to abide by the principals and practice the methods outlined in the book and I can honestly say that my life is so much better for it. Some parts I find difficult to reconcile and sure I have more challenging days but I always have a copy of the book with me, either in paperback or kindle, and I refer to it like a friend. “Limitless Sky” has been for me a feast of the spirit, the mind and the senses. I knew by simply looking at the cover that it would be an extraordinary, and illuminating story. I found myself, after having read the Magic Museum in Calcutta section with Jasper, so delighted and enchanted that I had to put the book down, sit up on my little futon, and gently rock back and forth to embody and circulate the energy that you inspired in my mind and vision. I do not exaggerate the effect that this and other sections of your writing had upon me. The balance of personal drama, theoretical exposition and vivid, sensual description is perfect. Much more fun than a dry dialogue from an Upanishad or a Plato. As you say, the book will find its way, or be sought out by those who may best benefit from it, like me. And for the Queer community, your elucidations of Tantric Shaivism easily refute any blanket rejection of “religion” and authoritarian hierarchies therein. That’s it, you see … an exquisite balance of delicious elements, very nutritious too.